To have a message thoughtfully considered by an audience requires messages that are relatable. It must have meaning in their everyday lives so they have levers to engage with and not simply conceptual ideas that entertain them for a few hours. Roy follows consistent communication principles in every message he delivers, whether workshop intensive or focused keynote topic. He not only wants to engage his audience, he wants the message to resonate so they can translate it into actionable strategies that get results in their world. 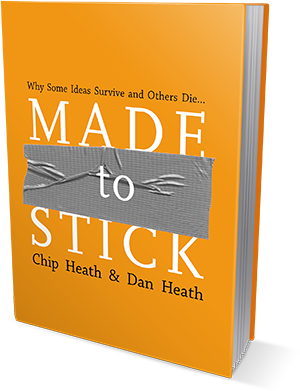 This "stickiness" communication approach is inspired by the Heath Brothers Made to Stick: Why Some Ideas Survive and Others Die... as well as Roy's many years of working with business leaders and those delivering service on the front line. Simplicity isn't about dumbing things down; it's about getting to the core point with unexpected clarity. Any audience will appreciate and thank you for brevity and a succinct message. To break through everyday noise, a speaker has to create some ruckus, break paradigms, have some fun and grab attention. In order for new ideas to stick, the audience has to want the message so they can use it for their own purposes. Great communication builds a bridge that allows an audience member to identify where they are and where they need to be. Roy mixes concrete facts with relevant examples for a clear articulation of the preferred future state. New ideas gain credibility from inside your organization and out. Real life examples from other industries, competitors or other institutions shake complacency when delivered by a speaker that has actually walked the talk. People want and need to be authentically moved. Audiences intuitively care more about people than numbers. The connecting link between the two must be properly conveyed so the message has legs and is understood. Thoughtful storytelling engages and moves every audience. The most evocative narratives drive change by modeling what to do, how to do it, but mostly by the idea that it's possible.